Our garden is in great need. We have so much to do. Hopefully, we will be able to make much progress this week. I’ve given the 5 year old and the 6 year old girls the job of planting the green beans and the 8 year old boy the job of planting the okra. The older boys will be finding a good place for some corn. If we can get that done…wow..that will be a good start! We’ve learned from some of our mistakes this year when preparing our garden: not enough compost, cows were in the garden area too long and packed the ground down. It needs a couple of dump truck loads of good dirt but we’re managing with what we have. Unfortunately rocks don’t compost. We’ve only planted a couple of rows of tomatoes and some herbs and several rows of peppers and something that looks like cabbage but no one can really remember what it is? The plants are just now starting to take off so hopefully the weather will warm up enough and the rain will be adequate and the plants will thrive. They’ve had a rocky start. 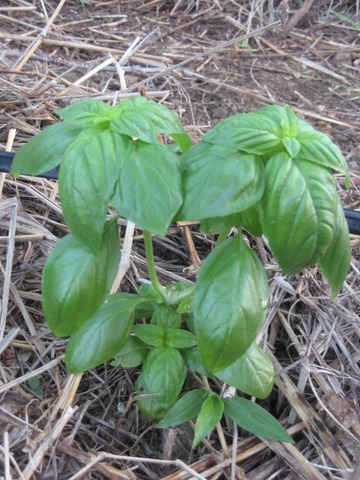 This year we planted a small herb patch closer to the house in the back yard. It has purple basil, genovese basil, thyme, cilantro, parsley, tarragon and dill. I’ve enjoyed watching these little plants grow. I’ve babied this patch and become very protective over it. It also had a rough start with the cow walking right through it, then the chickens scratching it up, the two year old pulling up the plants…. We’ve isolated the chickens in a chicken tractor and we’ve worked on fencing for the cows. So far…so good! The last couple of days, I’ve been reaping the rewards of fresh herbs right outside the back door. Last night we used the basil on homemade pizza. Today, we used the cilantro on our black bean burritos and nachos. Fresh herbs are amazingly more aromatic and have quite a bit more flavor than dried. I’m really looking forward to using this little patch this summer. And craving fresh garden produce…. soo wonderful! Fresh herbs and produce are so nice! My family and I enjoy eating from our garden.